Anyone who has ever studied sociology might remember a little book called “Folk Devils and Moral Panics”. It has quite an arresting cover and the story told is/was of 60s mods v rockers punch ups on south coast beaches. Now in its umpteenth edition the book is a deserved classic. Ok so sociologists can be easily attacked: they theorise mostly in a vacuum if not from ivory towers. However Cohen was definitely on to something. The theory of “deviance amplification”, as he called it, held that the flurry of media interest in summat and denunciations by the supposedly upstanding brigade in straight society creates a “moral panic”. This ultimately will only serve to swell the significance of the lot that fingers are being pointed at (folk devils). 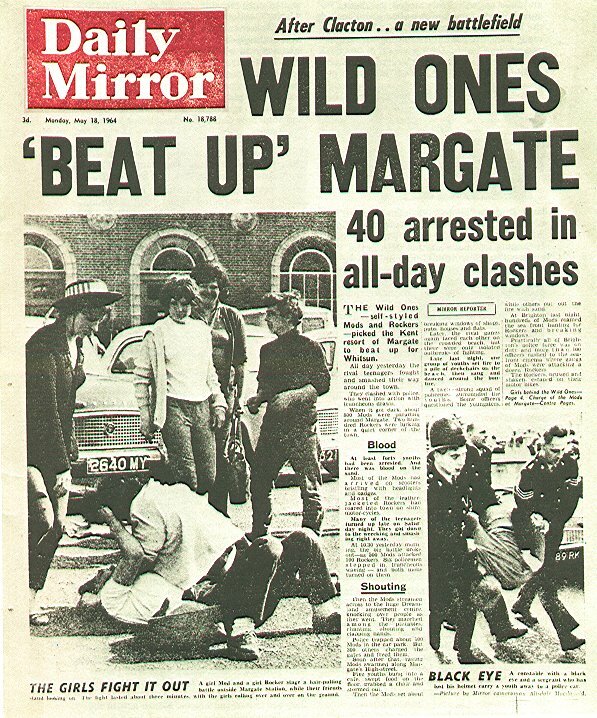 Cohen showed how relatively minor seafront skirmishes between rival gangs turned into sustained full-scale daily violence ‘cos of the shock horror headlines. You can see an element of this it in the reports that ASBOs are now a “badge of honour”. It also applies to the current proposals to deploy the forces of academics to sort out Islamic extremism. As it is, most lecturers feel that they are put upon; sinking under the weight of increased student numbers from the government’s 50% HE target whilst simultaneously subject to greater measures of audit and performance culture that were formerly absent: league tables of teaching rankings and research ratings etc, pressure to earn your own salary by attracting external funding and grants. Us lecturers may constantly claim that we have fallen behind other professions in pay terms but we get paid to do what most of us love doing: talking all day. I feel immensely privileged working in an environment of free-thought and creativity that you don’t really get anywhere else. I was able to organise a conference with the aforementioned Brivati on New Labour. We were able to think for thought’s sake – nothing particularly outcome-driven on that day and it was work. We are multi-taskers by definition but the rooting out radicalism call is not one that’s gone down well in the academic community. It's the police's job to tackle terrorism, universities must protect their students from discrimination by extremists whether Muslim BNP, or ALF whatever. However what lecturers don't have is the power of mind control. If we put the invasion of Iraq to one side, this government has had a largely good record of consultation and dialogue with British Muslims. Labour is the only party with Muslim representation in Parliament however as election results in constituencies from Rochdale to Bethnal Green and Bow demonstrated last year, the once unswervingly loyal population thought of as delivering the “Asian vote” are now fragmenting further and asserting themselves on religious lines. The term “multicultural” has unravelled to be multifaith - inter alia. Cameron is frantically trying to even the score – you may have seen Muslim A-lister Sayeeda Warsi on this week’s Question Time attacking the Iraq war, against Tory party policy. Heavy handed approaches are not the way to go about getting Muslims on side at a time when we need to strengthen community cohesion and race relations on campus. If the issue isn't handled sensitively things could backfire. There are a handful of radical Islamic elements in our universities who need to be counteracted by the power of debate. This initiative is already being interpreted as a McCarthyite witch-hunt and it could only inflate the influence of this tiny minority out of all proportion. It's the same principle of 'ban that record' re Frankie Goes To Hollywood and "Relax": trying to censor it sent it to the top of the charts. Unlike some of the other big names in sociology eg Marx, Weber and Durkheim, Stanley Cohen is still with us. I wonder what he makes of it all.